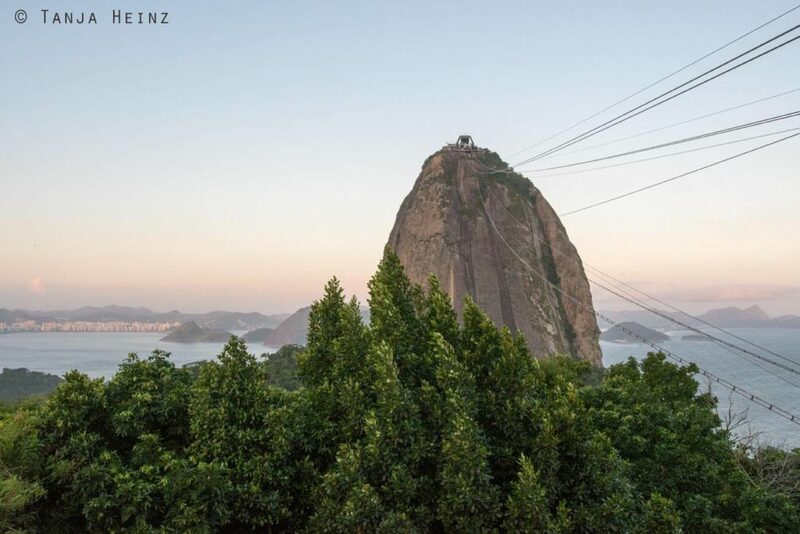 One of the most attractive places in the Cidade Maravilhosa (Marvelous City) – the nickname of Rio de Janeiro – is undouptedly the Sugarloaf Mountain. With its height of 396m, the Sugarloaf Mountain is located at the edge of the Guanabara Bay and together with the statue Christ the Redeemer on the Corcovado one of the city’s landmarks. 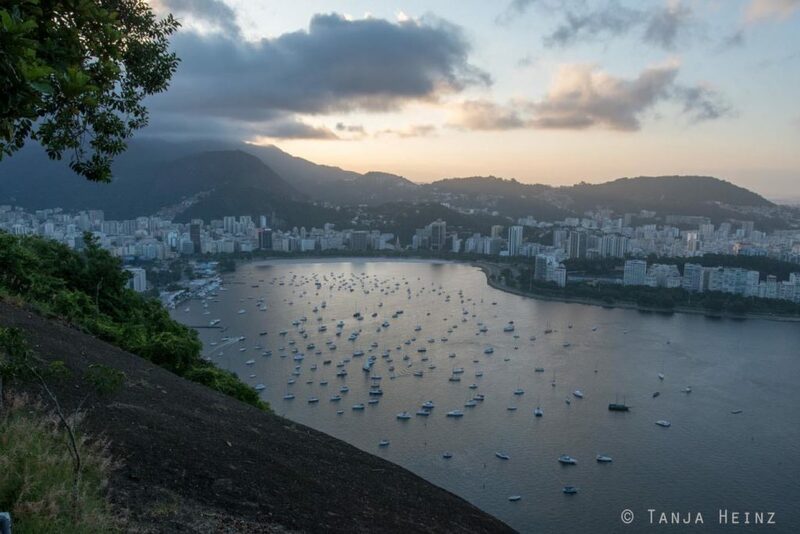 The Sugarloaf Mountain is located on the peninsula Urca, and thus, in the South of Rio de Janeiro like the Copacabana. Of course the Sugarloaf Mountain was on our list on our journey through the South of Brazil. 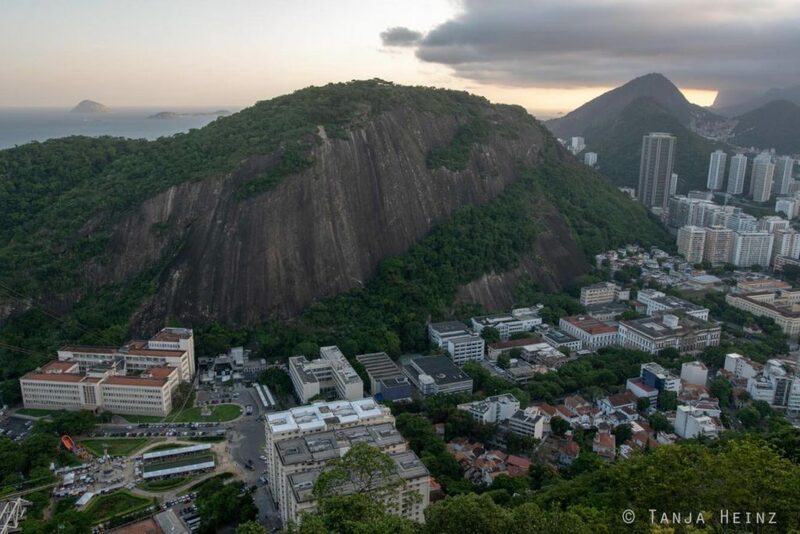 On the peninsula Urca you can find not only the Sugarloaf Mountain, but also the same-named Morro da Urca. 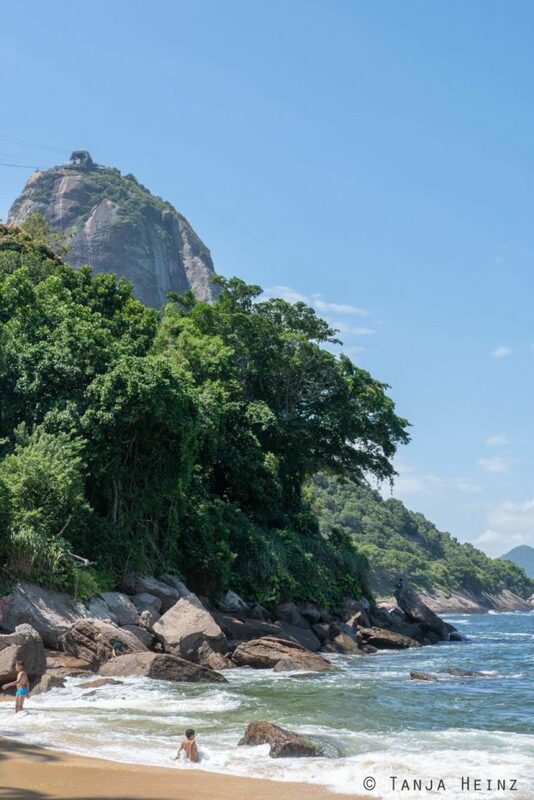 At the edge of this Morro da Urca is a narrow beach – the Praia Vermelha. 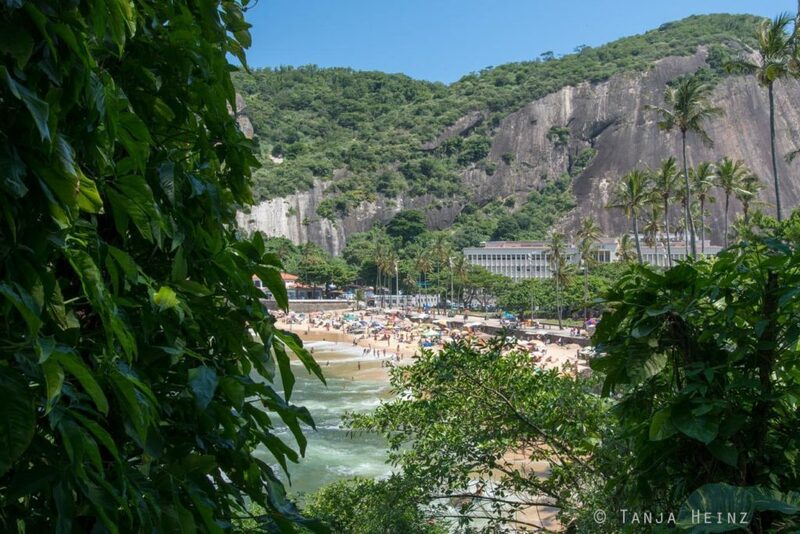 From the Praia Vermelha you will get a view onto the Sugarloaf Mountain. 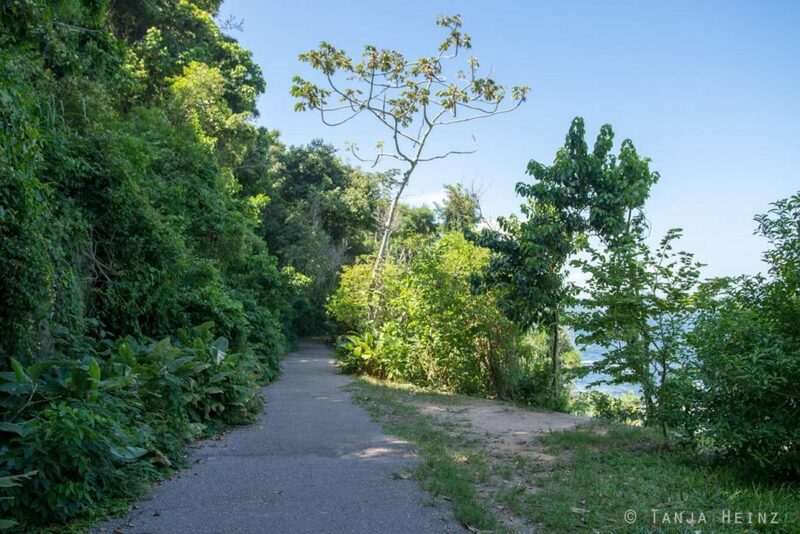 Very close to the Praia Vermelha you can find the entrance of a very popular path along the Morro da Urca. And that is the Pista Cláudio Coutinho. 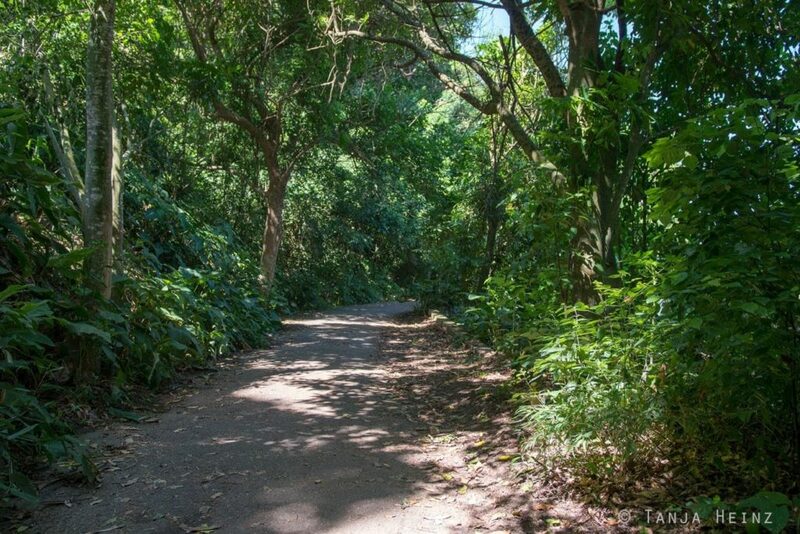 The path Pista Cláudio Coutinho leads through a forested area along one side of the Morro da Urca. Sometimes paths are more and sometimes less shaded. But at some places the dense vegetation allows you to get a view of the sea. And of course of the Sugarloaf Mountain as well. Along the path you can see invase exotic plant species. Invasive plants are species that are not indigenous, and thus, and alien species in a certain area. However, invasive plant species at the Sugarloaf Mountain are controlled. It is important to control these invasive plant species, as they have a competition advantage over indigenous plant species as they are able to grow and reproduce more rapidly. As a consequence an ecosystem might become less diverse and fewer plant species will survive. On our path on the Pista Cláudio Coutinho we spotted one of those invasive plant species. And that was a jackfruit (Artocarpus heterophyllus). 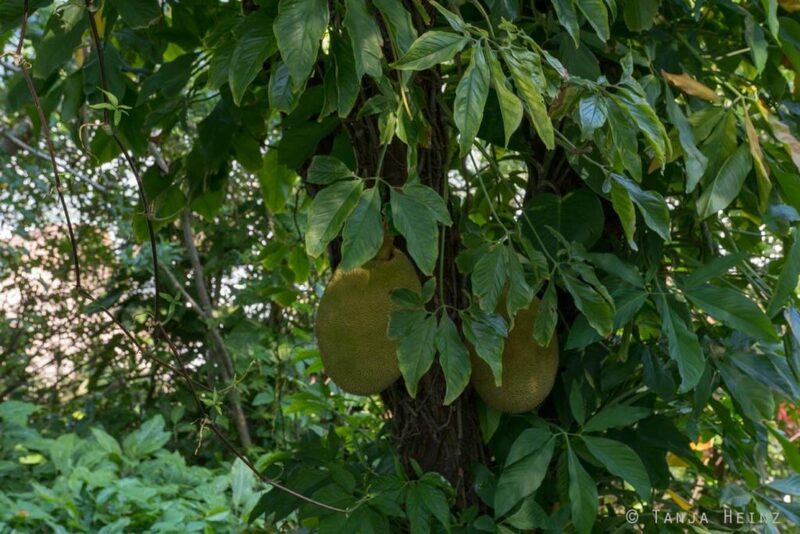 It was not the first time that we spot a jackfruit. 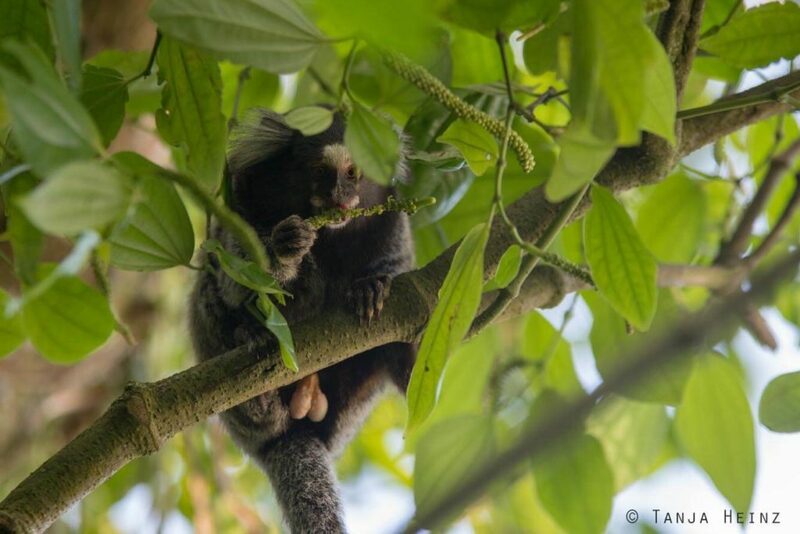 In that moment I remembered my encounter with with the crested capuchins in the Reserva Natural Vale as the monkeys were feeding on a jackfruit. We also spotted indigenous plant species or indegenous trees, respectively, like the “Pau-Brail” (Caesalpinia echinata). 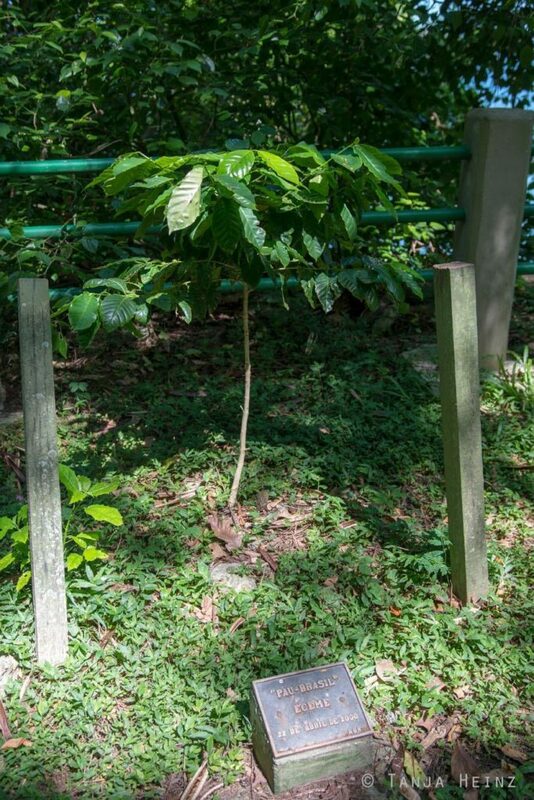 This tree was planted on the 22th of April in 2000. 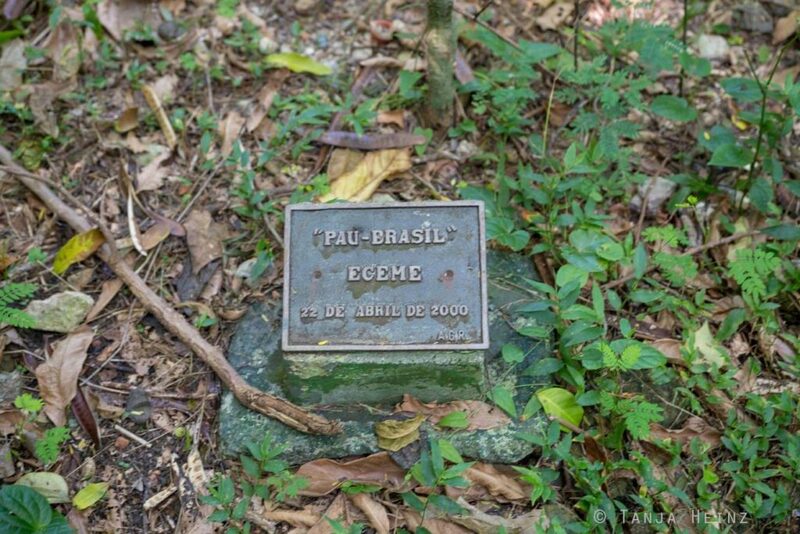 The “Pau-Brasil” is indigenous in Brazil, but endangered. Therefore, the World Conservation Union IUCN lists this tree species in the category “endangered”. Its wood is also known as Brazilwood. The “Pau-Brasil” is indigenous in the states Alagoas, Bahia, Espírito Santo, Minas Gerais, Paraíba, Pernambuco, Rio de Janeiro, Rio Grande do Norte and Sergipe. Areas of its original distribution are almost completey destroyed. The main threat of the “Pau-Brasil” is deforestation. In the past the “Pau-Brasil” was also take from the woods because it was a dyewood. 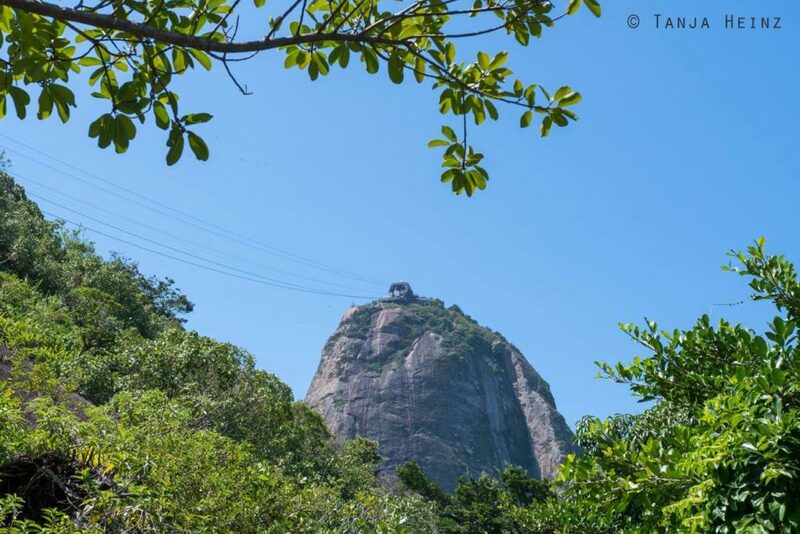 Nevertheless, I you wish to visit the Sugarloaf Mountain via the Pista Cláudio Coutinho, you can do so. In general there are two options or cable railways, respectively, to the Sugarloaf Mountain. One cable railway leads from the Praia Vermelha up to the Morro da Urca and the other one from the Morro da Urca to the Sugarloaf Mountain. 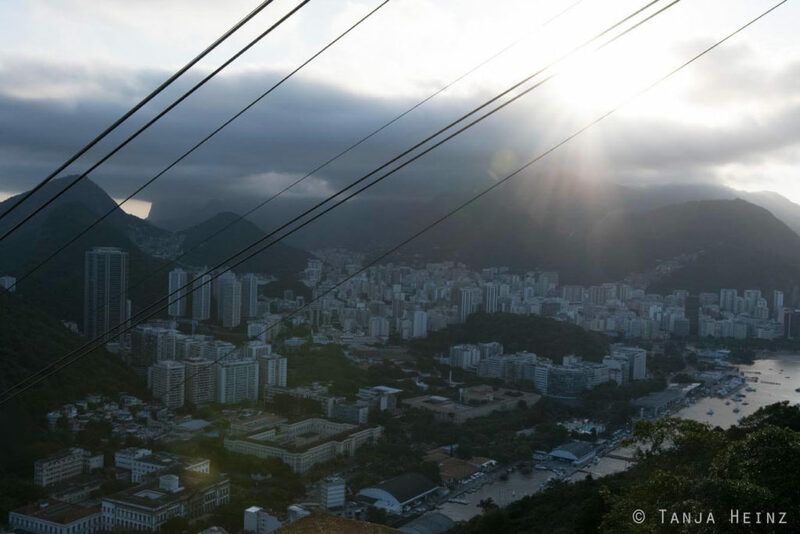 If you wish to take only the second cable railway from the Morro da Urca, you have to hike up the Morro da Urca. If you walk from the entrance of the Pista Cláudio Coutinho a few meters, you have to turn left. 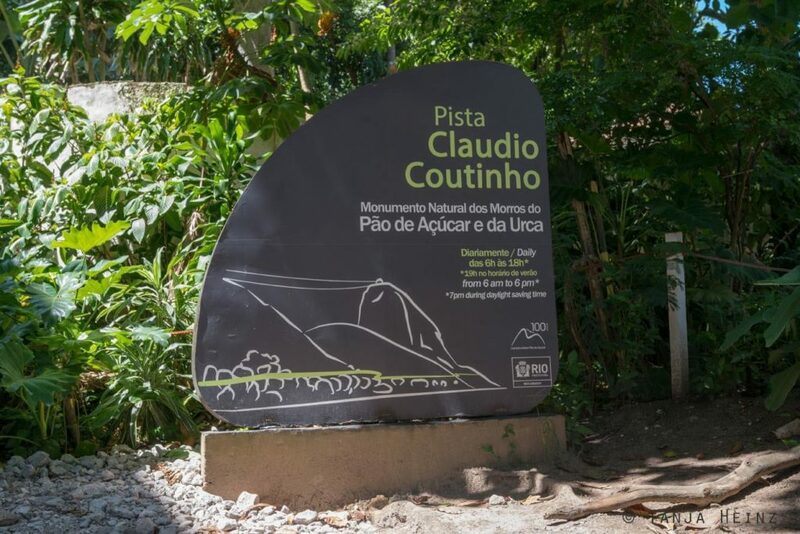 There are signs that indicate on the Pista Cláudio Coutinho where to hike up the Morro da Urca. You won’t miss it. 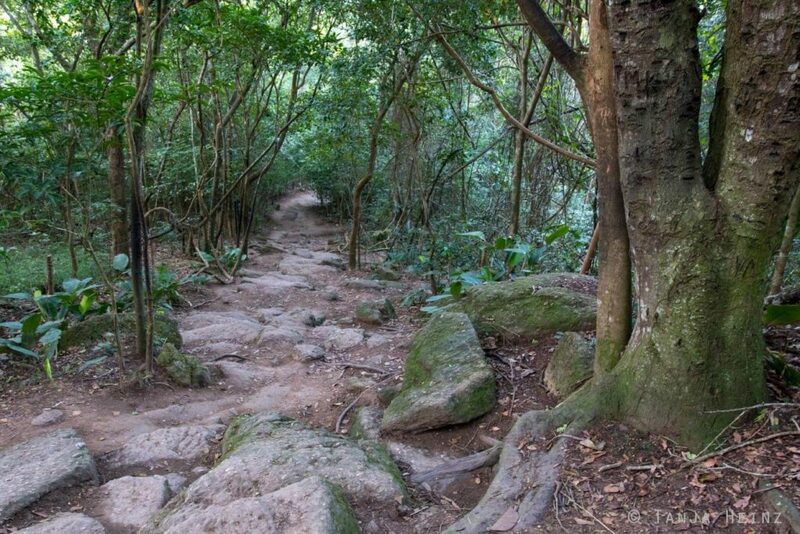 The path leads steeply up and is well frequented by visitors of the Sugarloaf Moutain. … and at other places roots characterize the path. 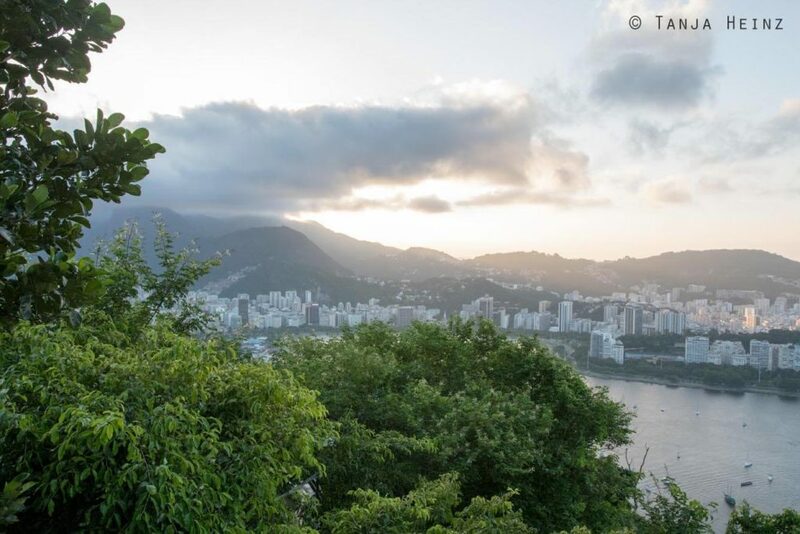 On the top of the Morro da Urca you can enjoy a wonerful view over Rio de Janeiro, and of course, over the Sugarloaf Mountain (see some photographs below). However, maybe there was one more reason why I wished to see the Sugarloaf Mountain? 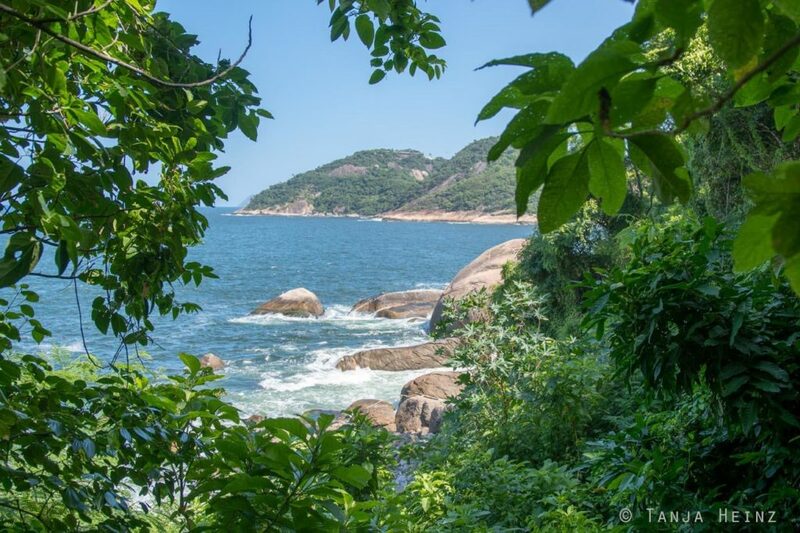 As you are on a blog which is about many wild animals, of course, I was in Rio de Janeiro not only to see the wonderful Sugarloaf Mountain. 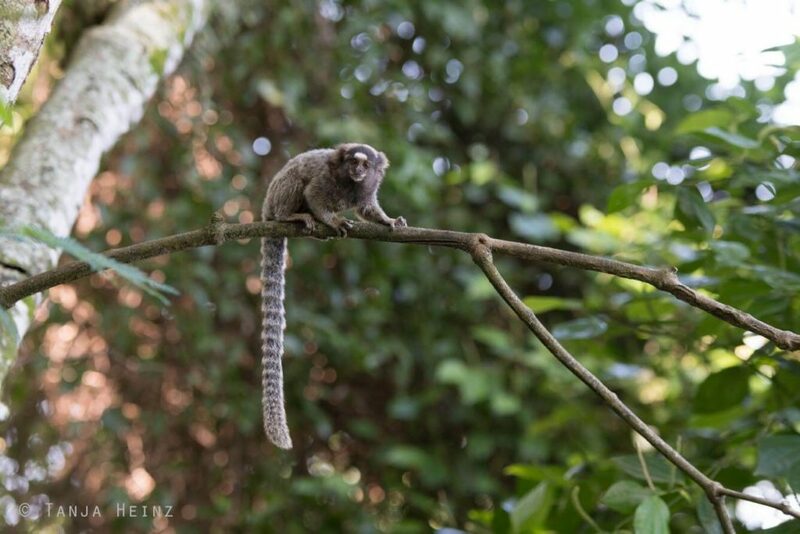 While I did not expect to see any wild animals while in Vitória – although I did fortunately – I was looking specifically for monkeys around the Sugarloaf Mountain in Rio de Janeiro. 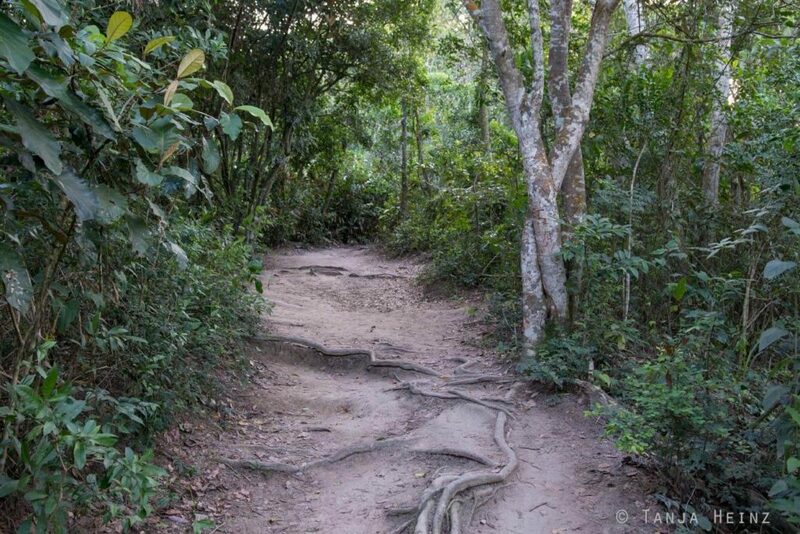 Because according to my travel guide a group of monkeys live in the forests around the Pista Cláudio Coutinho. 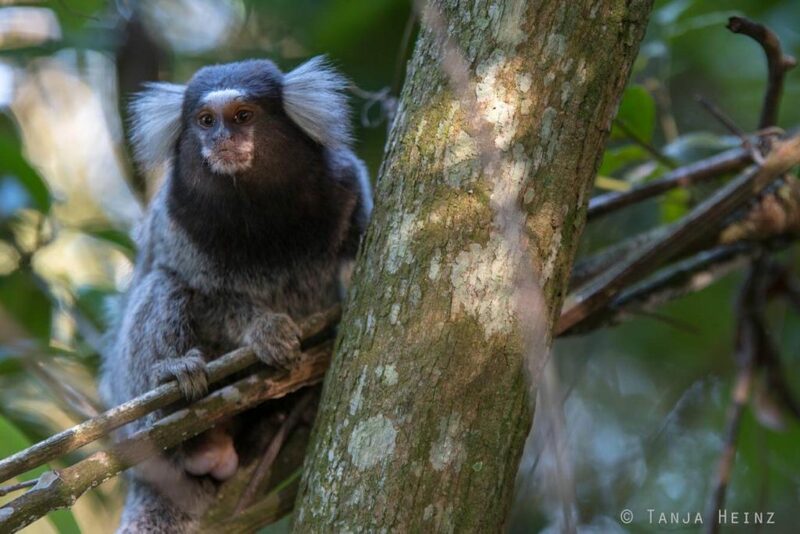 To be more precisely, I saw common marmosets (Callithrix jacchus). Common marmosets are from the genus Callithrix. 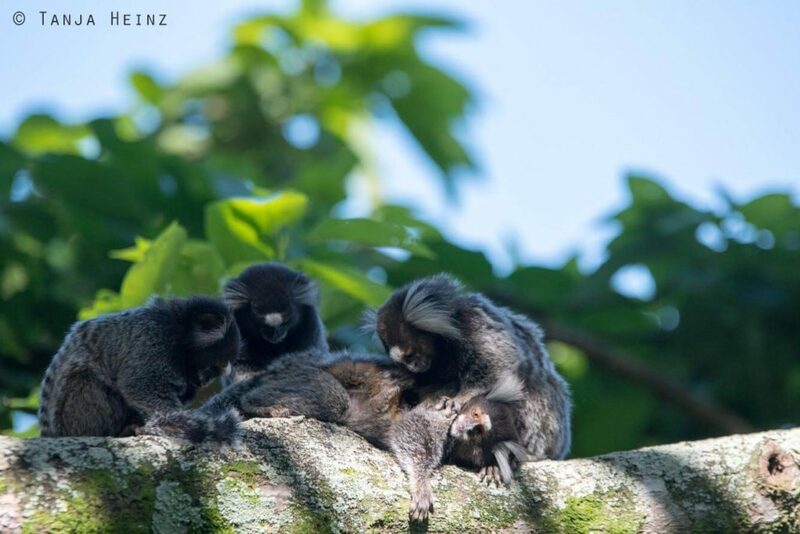 Together with monkeys of the genera Mico and Cebuella they belong to the marmosets. 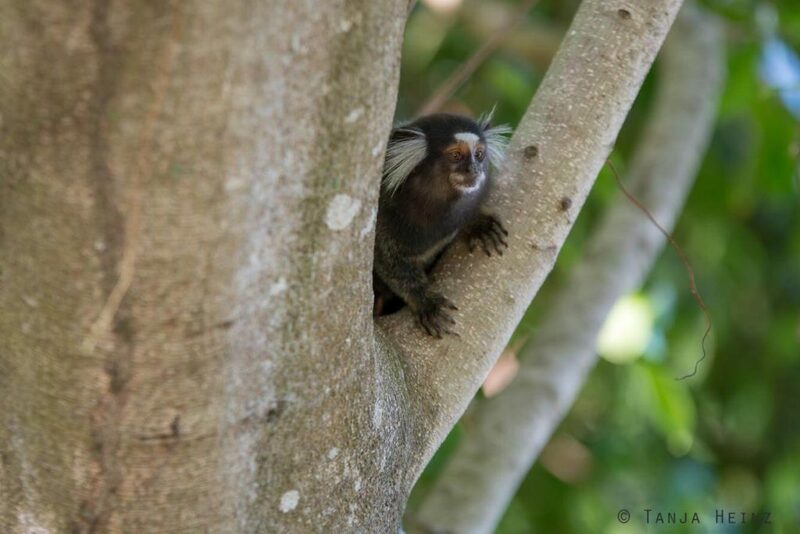 If you know my article about the Geoffroy’s marmosets, then you know that marmosets belong to the family Callitrichidae. 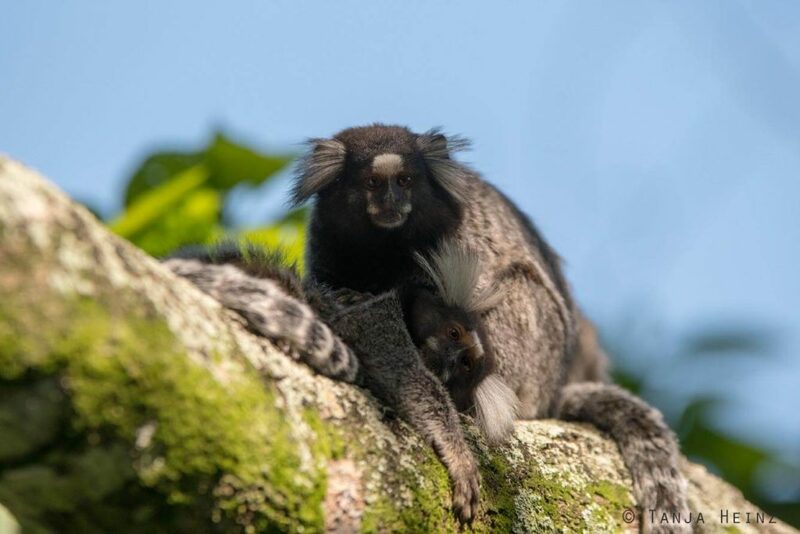 Marmosets form together with the lion tamarins (Leontopithecus), one monkey of the genus Callimico and the tamarins (Leontocebus und Saguinus) the family Callitrichidae. 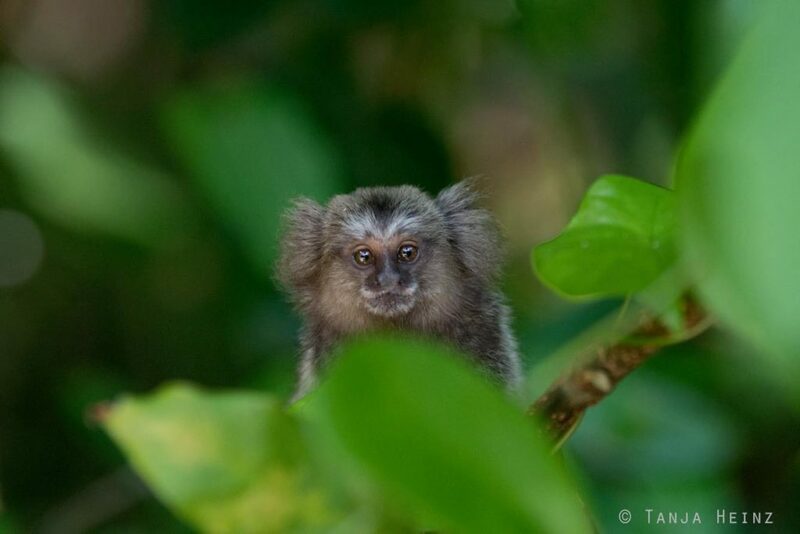 Common marmosets can be easily recognized by their white ear tufts. But young animals still do not have these white ear tufts. Characteristically their pelage is a mixture of grey and brown and their tails are banded. 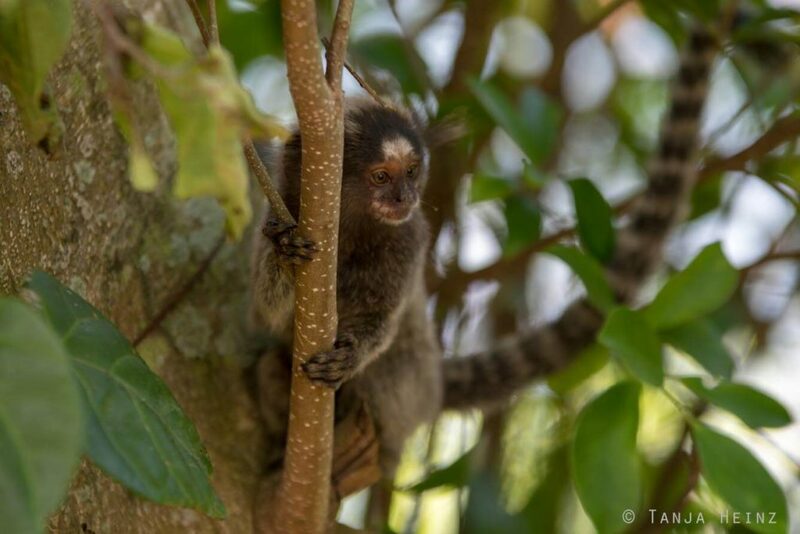 Young common marmosets do not have white ear tufts yet, however, their tail is already banded. The head of common marmosets is brown, but on the forehead they have a white blaze. Typically, animals of the family Callitrichidae have claws on their fingers and toes (except the big toe). 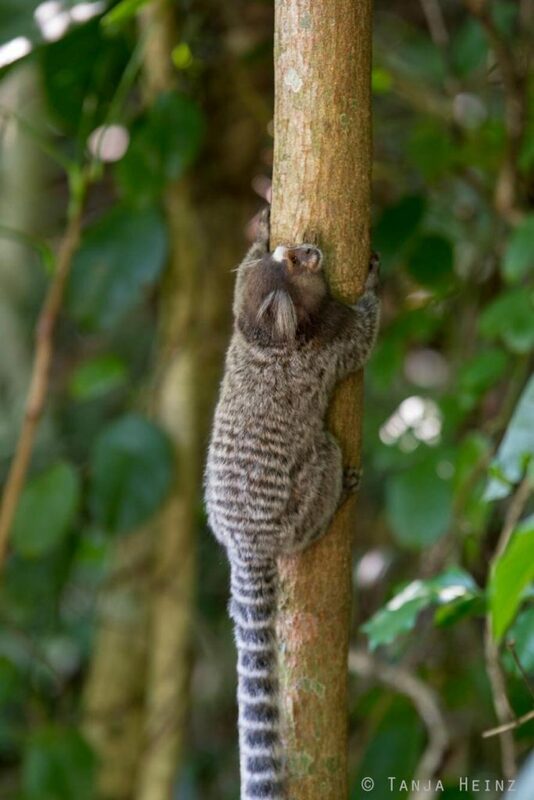 Therefore, common marmosets are able to climb up and down on a vertical tree trunk. 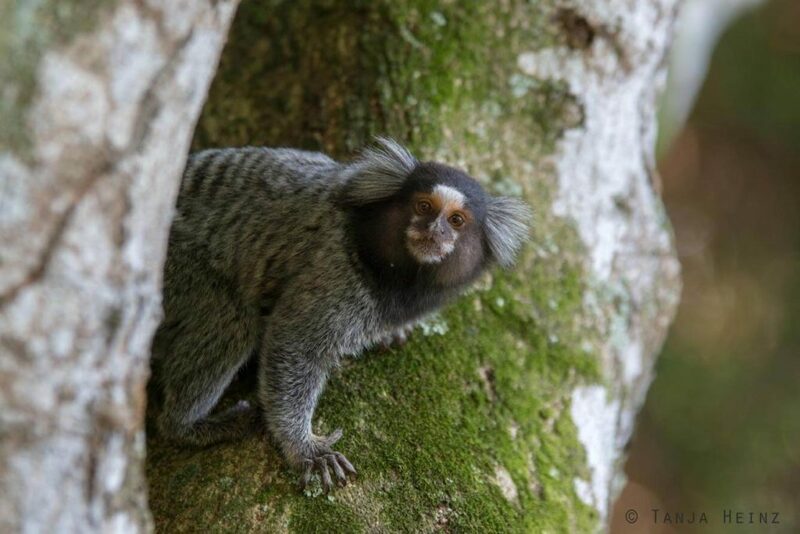 Actually, common marmosets do not naturally occur at the Sugarloaf Mountain. They are an invasive species in the woods of Rio de Janeiro. This causes several problems. 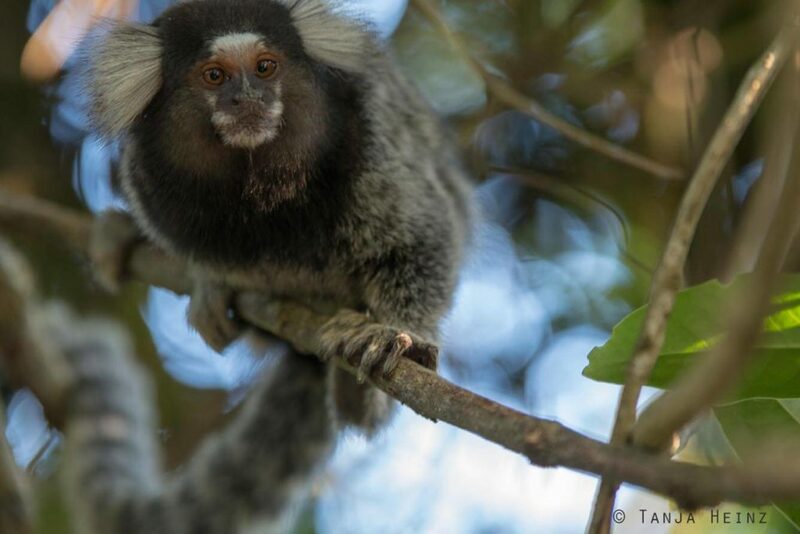 On the one hand, common marmosets feed on eggs of native birds, and on the other hand, they compete wih native fauna of Rio de Janeiro for food and territory. Furthermore, common marmosets reproduce very rapidly and they can transmit diseases. 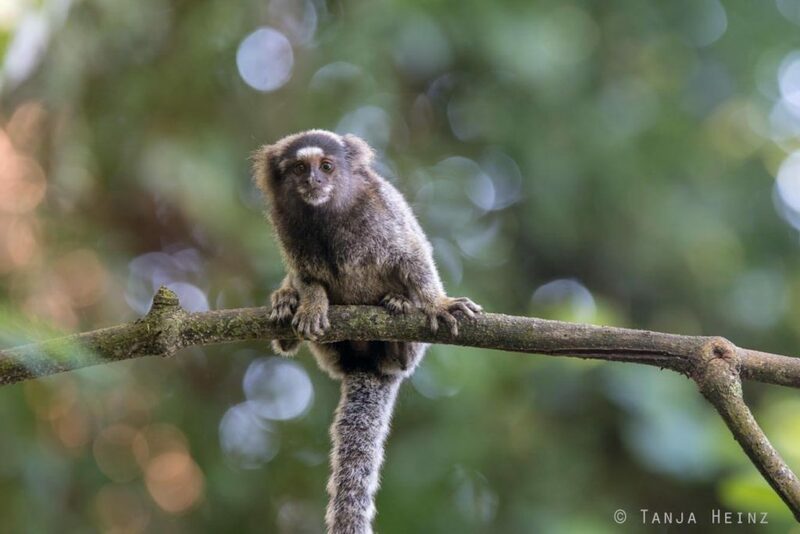 Therefore, it is absolutely prohibided to feed common marmosets at the Sugarloaf Mountain if you want to do something good for the fauna of Rio de Janeiro! 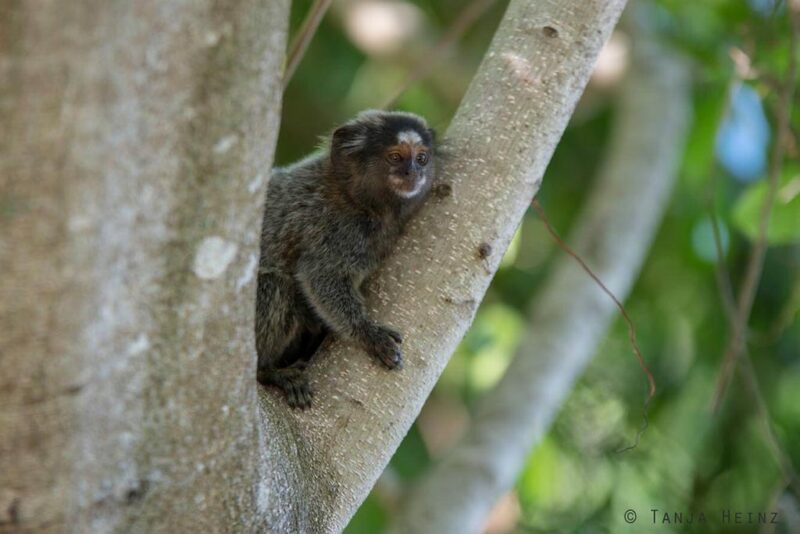 Originally, common marmosets live in the Northeast of Brazil in the states Alagoas, Pernambuco, Paraíba, Rio Grande do Norte, Ceará, Piauí, Maranhão and Bahia. According to the IUCN they are not endangered, and thus, listed as “least concern” by the IUCN. Common marmosets possess specialized incisors which enables them to gnaw holes into the tree bark, because they feed on tree saps and gums. They also eat fruits, flowers or nectar. They are not vegetarians as they also feed on frogs lizards, spiders and other insects. 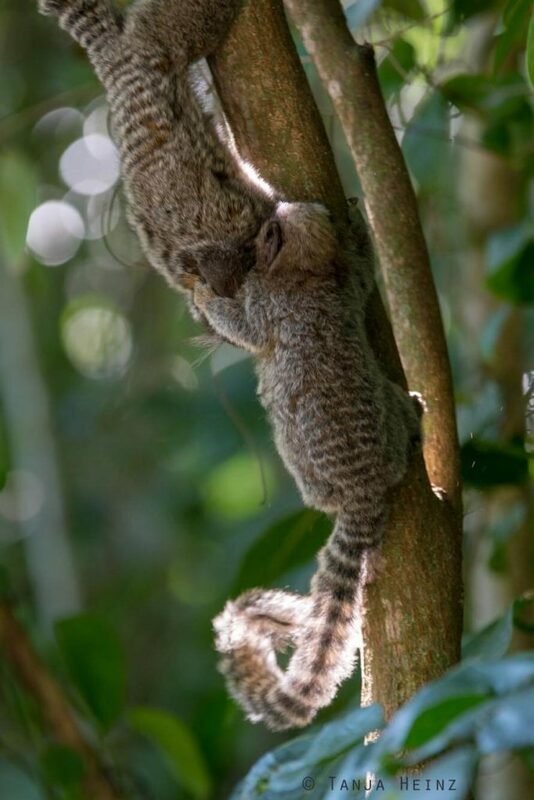 In Vitória I could observe Geoffroy’s marmosets gnawing holes into the tree bark, but not on that day with common marmosets at the Sugarloaf Mountain in Rio de Janeiro. At times some individuals were sitting in the tree and feeding on flowers. 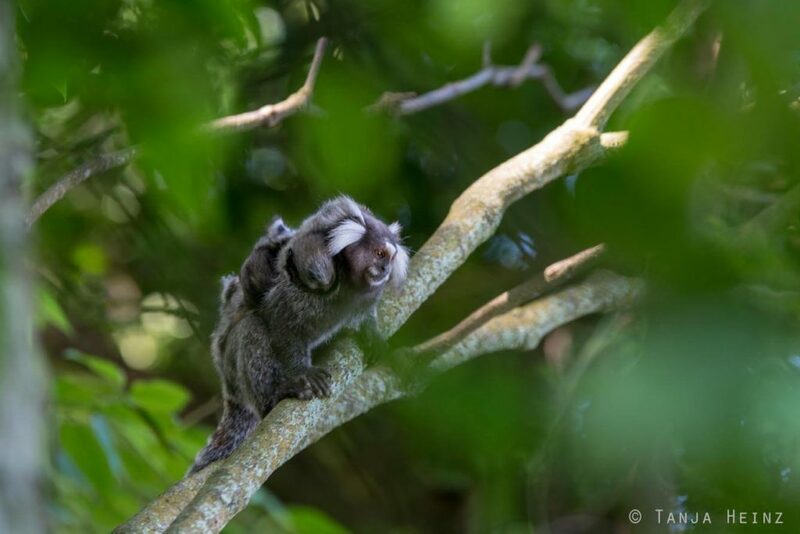 But my full attention got one adult marmoset when it apparead with two young on its back. However, as fast as it appeard, as fast it vanished again. Of course, I did not follow this individual. Maybe it was just more cautious because of the two young on its back. By the way, members of the family Callitrichidae – like common marmosets – usually give birth to twins. 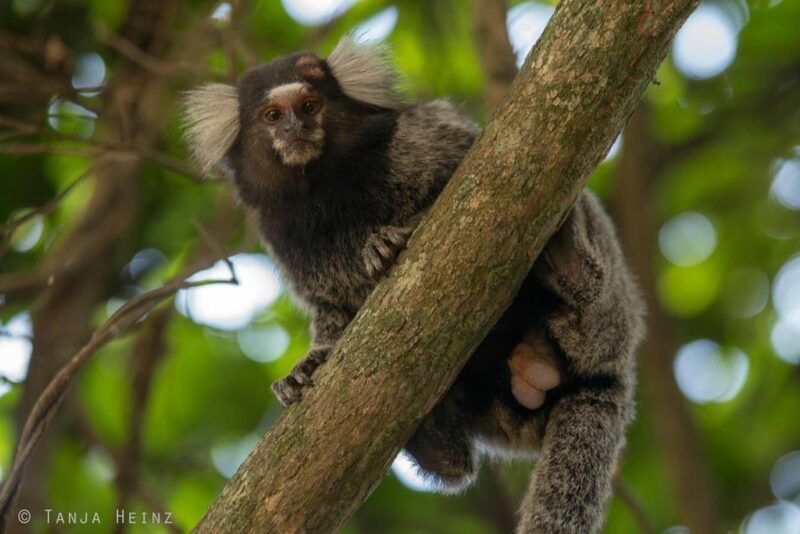 As males and females look the same in common marmosets and as both sexes care for the young, I cannot tell if this common marmoset was the mother or the father of the twins. Or maybe it was one of their adult sibling? 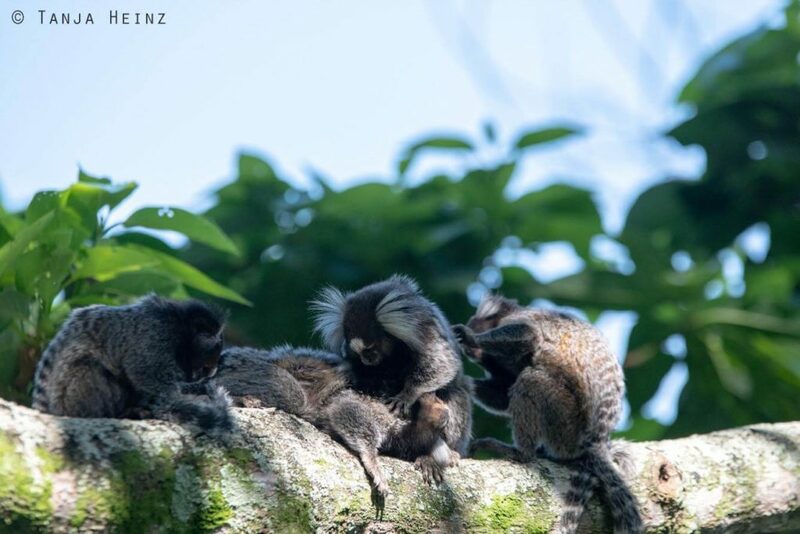 A group of common marmosets usually consists of about ten animals including one dominant reproducing pair and serveral adult and young animals. All members of a group care for the young. Therefore, I cannot tell who was carrying the twins around. 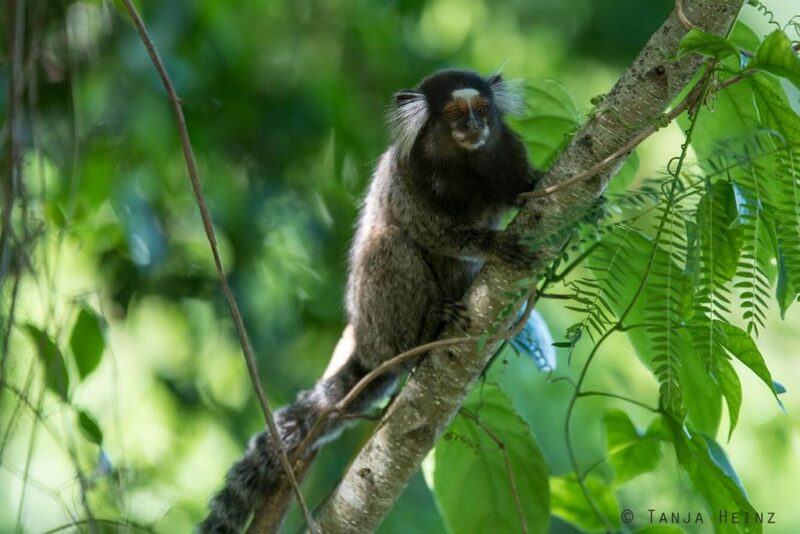 Nevertheless, we met several groups of common marmosets during our walk on the Pista Cláudio Coutinho. But I cannot tell how many different groups we saw. I neither can tell the size of those groups, but it might have been around ten animals of each group. 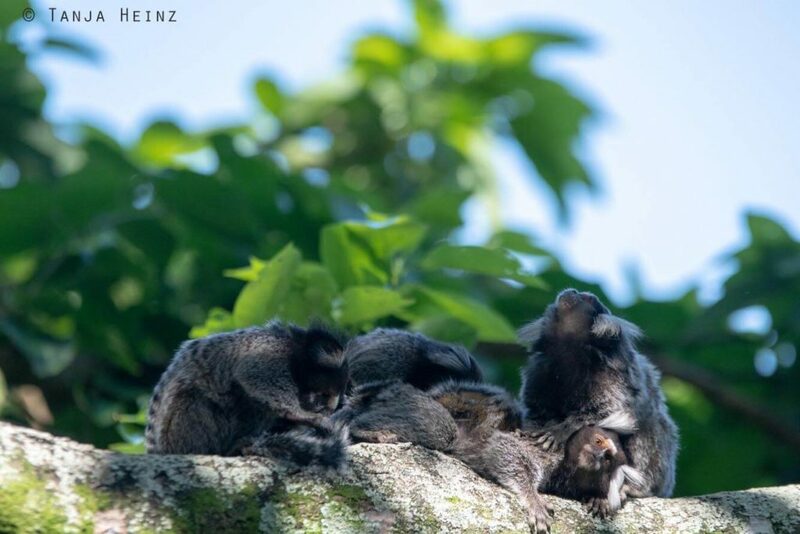 Under the hot midday sun I spotted a group of common marmosets at the Sugarlaof Mountain that made itself comfortable on a tree trunk. … they were busy with grooming each other. Just a few meters away there were two more common marmosets that were occupied with grooming. Did they belong to the same group? However, I guess yes, because common marmosets live in territories. 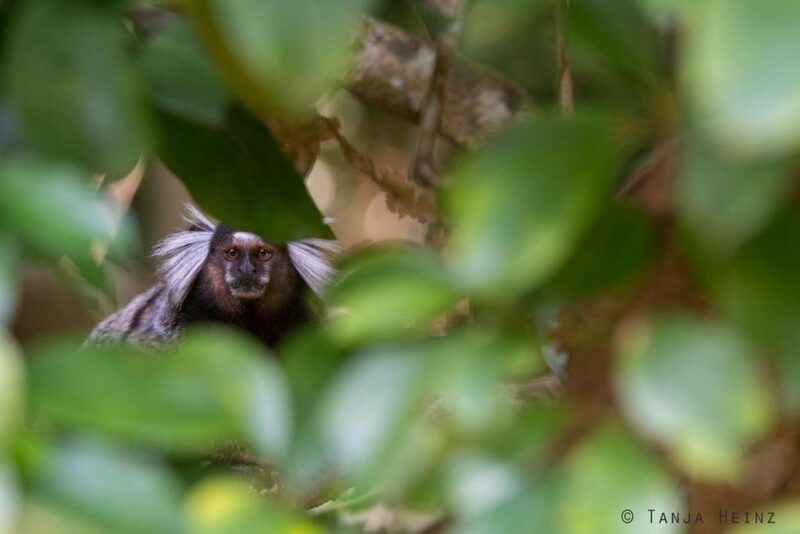 Occasionally we spotted some more common marmosets hidden in the dense vegetation. Sometimes they were just suddenly there looking into our direction. I cannot tell how often we met common marmosets. But it was definitely several times. I was also happy when I saw one of the young animals. It appeared to me quite independent. In one moment it was moving onto a thin branch looking into my direction. As if it was posing just for a photograph. 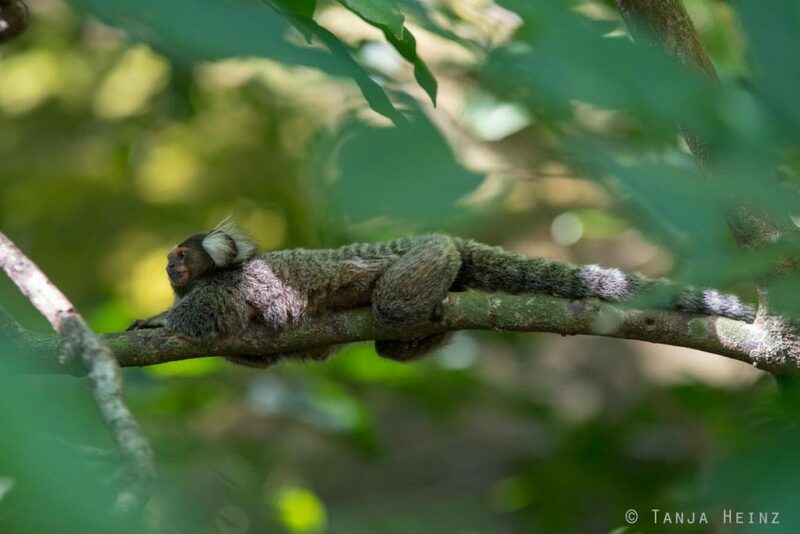 With its claws – which are typical for members of the family Callitrichidae as I mentioned above – the young common marmoset could moving on the branch without problems. 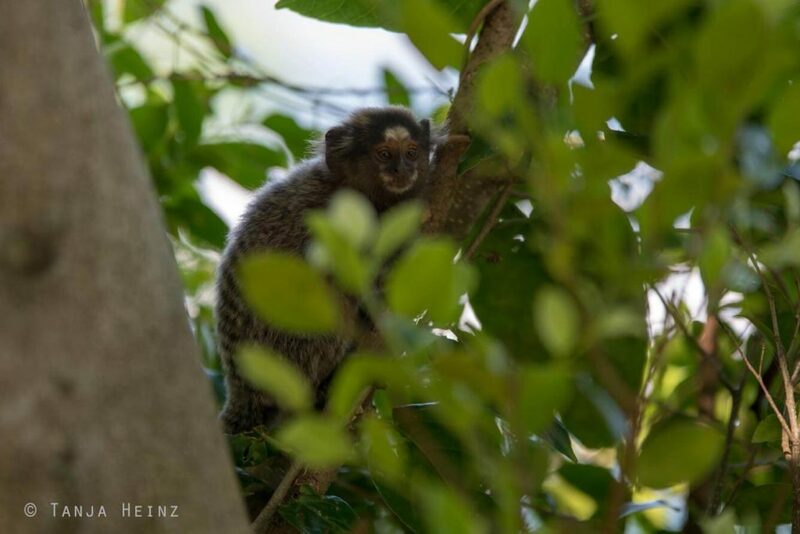 When we walked back on the Pista Cláudio Coutinho into the direction of the entrance area, we spotted another group of common marmosets. This time it was especially interesting. Because the common marmosets were quite active. Wow. I was so grateful. 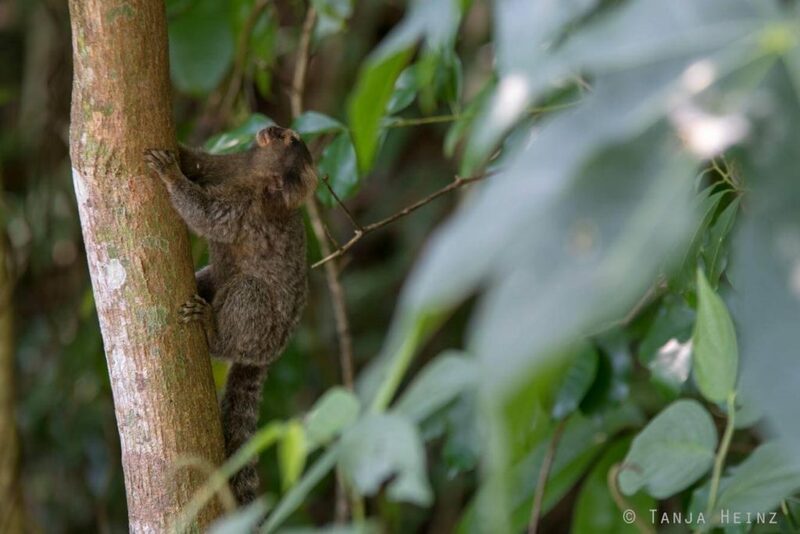 While I could observe a typical method of foraging in Geoffroy’s marmosets, this time at the Sugarloaf Mountain I could observe common marmosets playing. 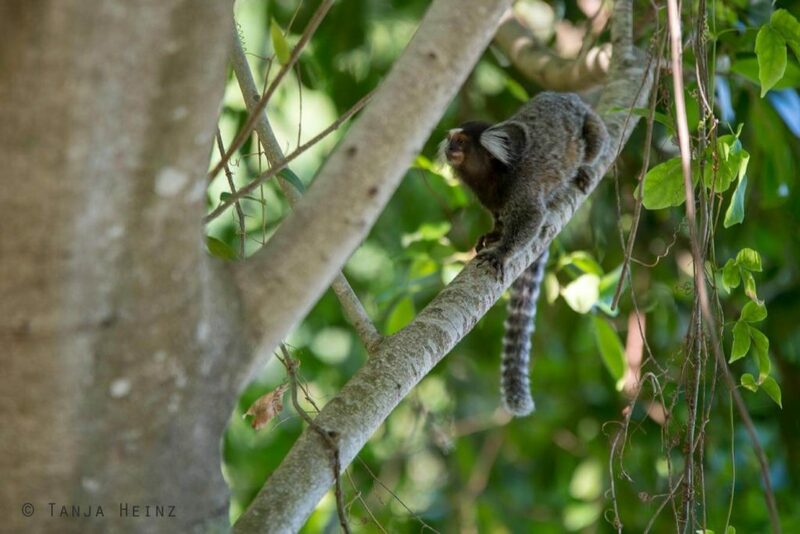 However, one of the smaller common marmosets apparently did not participate or was not allowed to do so, respectively. It climbed up the trunk of a small tree. And sat down on a branch. Cautiously it was peeking out from the foliage. It did not move for a few seconds. However, just a few moments later it vanished again. In general, marmosets move quite swiftly. Therefore, it is very challenging taking photographs of them. Of course, we did not only stay with the common marmosets but also climbed up the Morro da Urca in the late afternoon to get a better view onto the Sugarloaf Mountain. 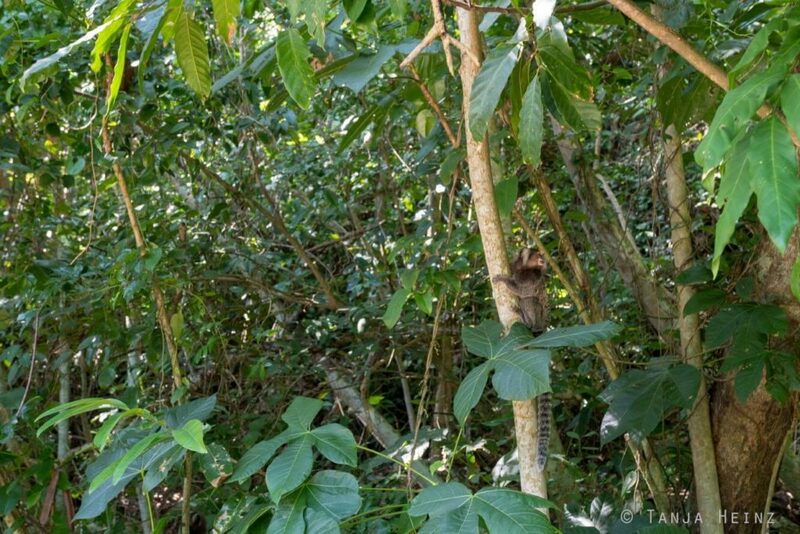 But when we were climbing up we observed more common marmosets. Hidden behind dense vegetation they seemed to observe us. But this time again, the common marmosets were in one momenten here and in just another moment there. I was happy when one of them was sitting on a branch for a few seconds. But most of the time not for very long. Apparently this group as well was in the mood for playing. Sometimes they got caught up in each other, and sometimes they seemingly played hide and seek. 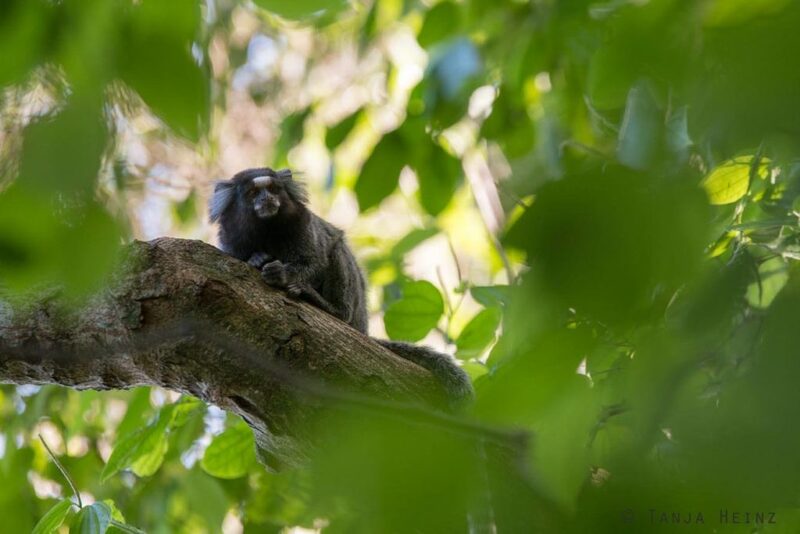 One of the common marmosets was calmer and climbed up a tree. 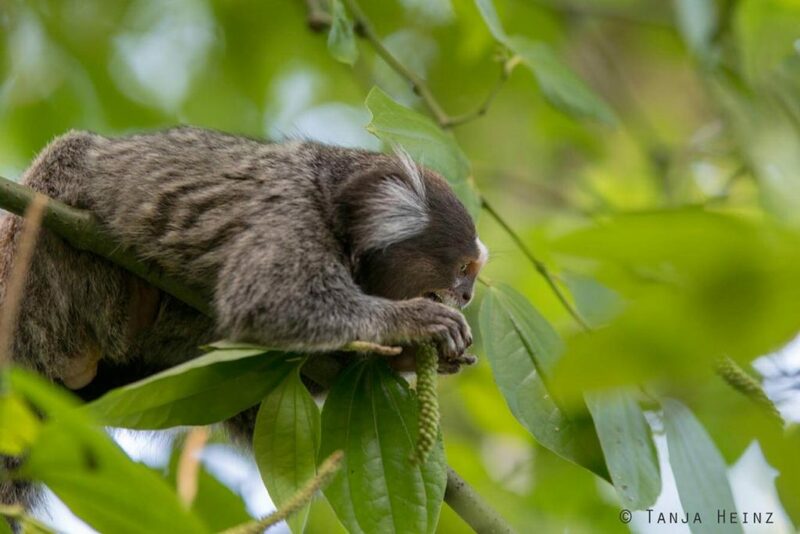 Due to their claws common marmosets move comfortably even on thin branches and might remain on them for a while. 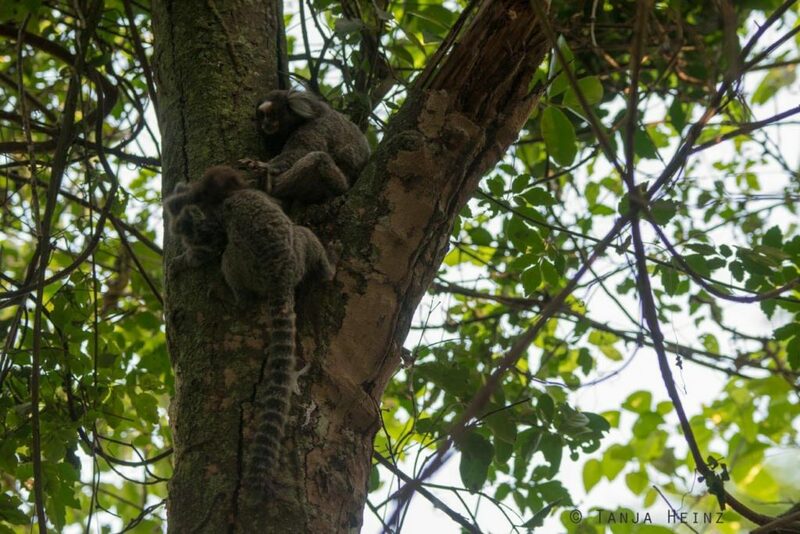 Nevertheless, there are not only common marmosets at the Sugarloaf Mountain. In the next section you can read about other animals that live in the forests around the Sugarloaf Mountain. Of course there are many more animals living around the Sugarloaf Mountain. However, unfortunately we did not observe many of them on our stay at the Pista Cláudio Coutinho. Only at the end of the Pista Cláudio Coutinho we spotted a boat-billed flycatcher (Megarynchus pitangua). 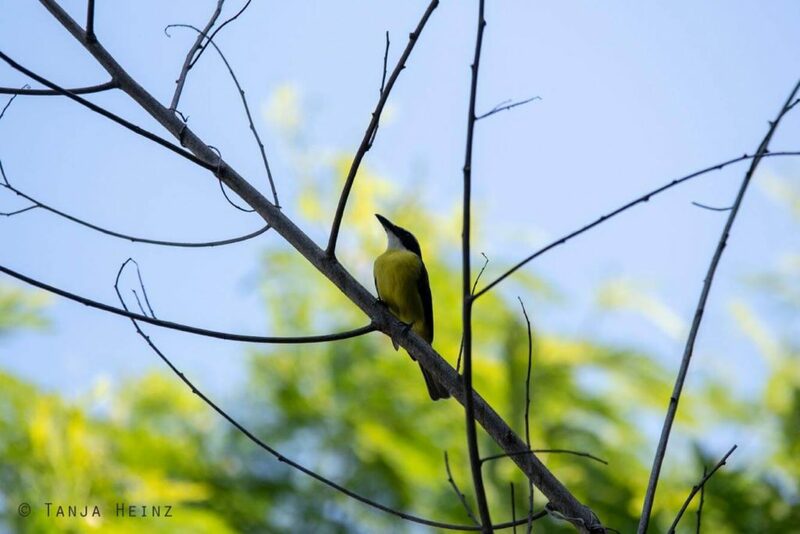 But if you visit the forests around the Sugarloaf Mountain to the right time you might also spot Brazilian tanagars (Ramphocelus bresilius) – which I saw as well in Ubatuba – but also rusty-margined guans (Penelope superciliaris), violaceous euphonias (Euphonia violacea), sayaca tanagers (Thraupis sayaca) and rufous-collared sparrows (Zonotrichia capensis). 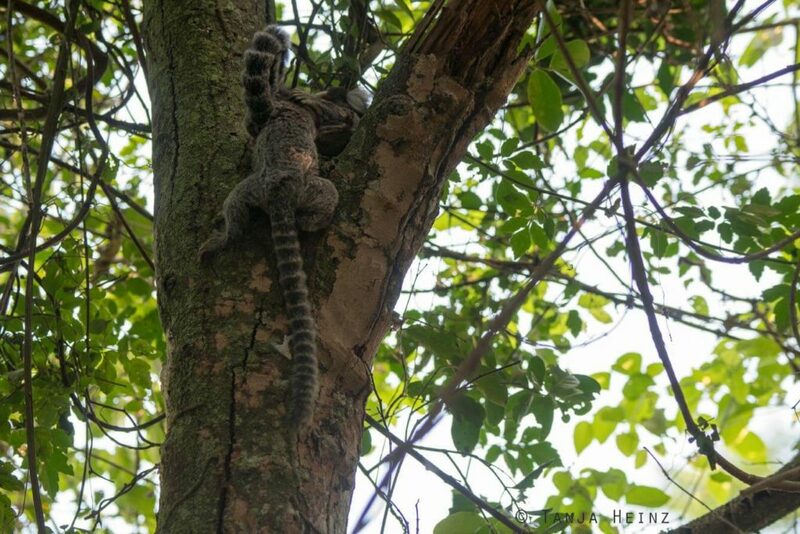 At the Sugarloaf Mountain also live the black and white tegu (Tupinambis merianae), lizards like the Amazon lava lizard (Tropidurus torquatus), the big-eared opossum (Didelphis aurita) and butterflies like the Morpho achilles achillaena. Even snakes like the boa constrictor (Boa constricto) occur around the Sugarloaf Mountain. As we walked on the Pista Cláudio Coutinho during the day, we could not observe many different animals. This is probably not only because of the time of the day, but also because of the people visiting the area around the Sugarloaf Mountain. The Pista Cláudio Coutinho was not overcrowded on that day, but still there were some visitors. It is a very nice local recreation area in the middle of the big city Rio de Janeiro. Therefore, I understand why animals hide during the day. We climbed up the Morro da Urca, but we did not take a cable railway up to the Sugarloaf Mountain. Anyway we got a wonderful view of the Sugarloaf Mountain from the Morro da Urca. It was late in the afternoon. The cable railway was still open. From above we saw the start of the cable railway. It was cloudy on one side of the city, but the view onto Rio de Janeiro was still very beautiful. 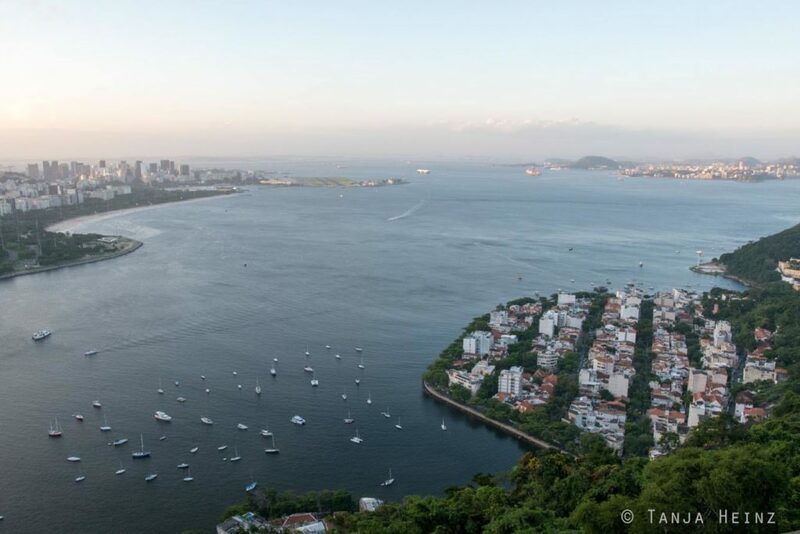 At the Sugarloaf Mountain you are at the edge of the Guanabara Bay. Although it was already late on that day, there were still some people on the Morro da Urca. Of course, the colors of the Sugarloaf Mountain were impressing. However, as it was getting dark we finally decided to walk down the Morro da Urca. 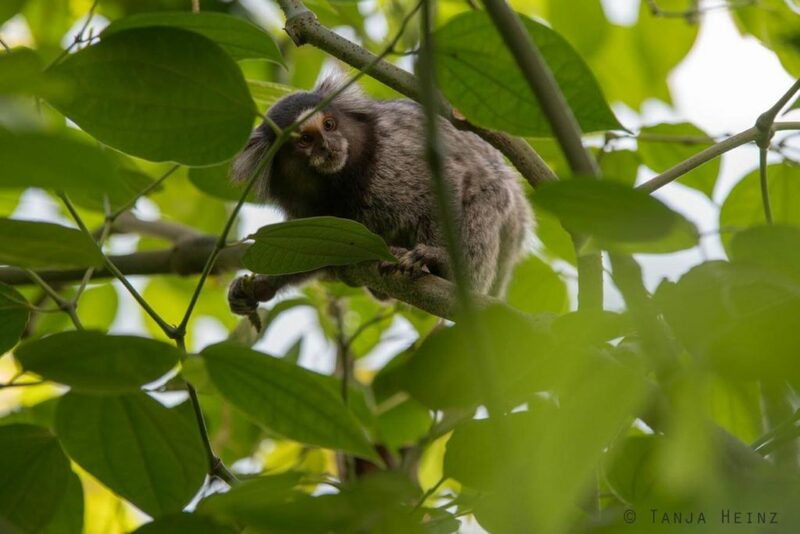 The forests around the Sugarloaf Mountain offer a habitat for several animals including common marmosets. 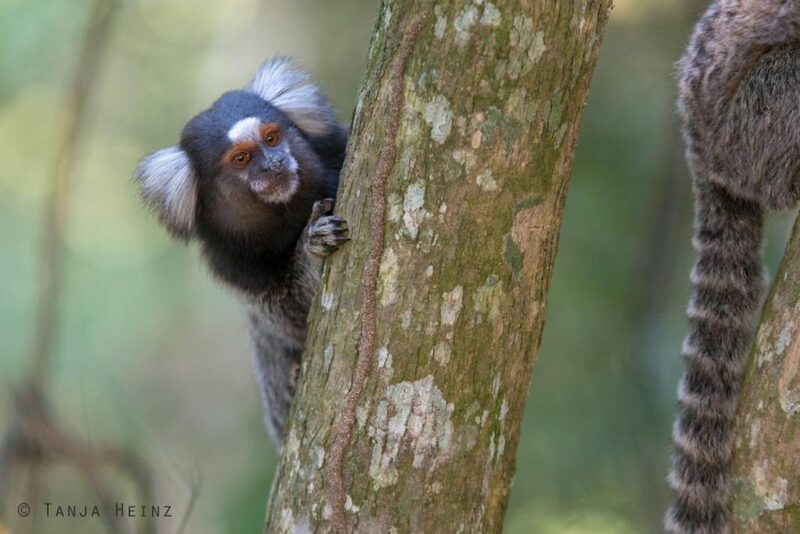 If you walk along the Pista Cláudio Coutinho, which you can reach from the Praia Vermelha, there is a great chance to see groups of common marmosets. 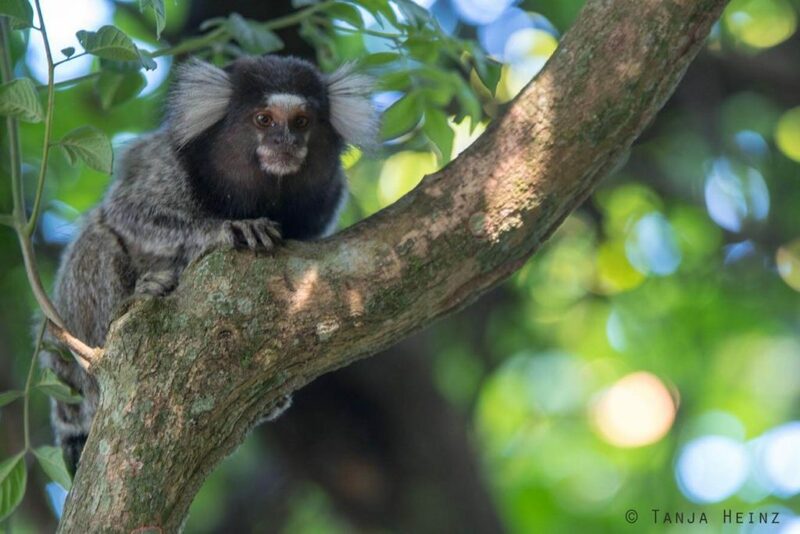 Although common marmosets are not native to the forests in Rio de Janeiro, quite many people are interested in seeing these animals. 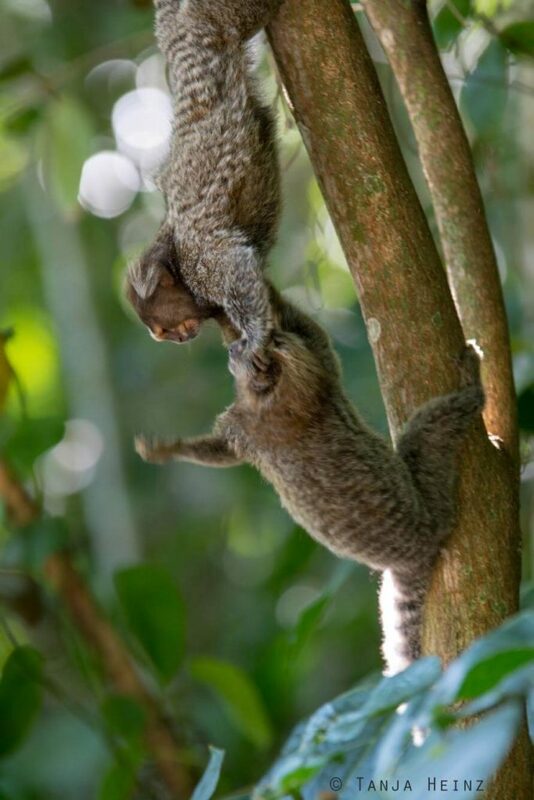 However, there is one important point: Don’t feed the common marmosets! There are two airports in Rio de Janeiro. On one side there is the international Aeorporto Galeão, which is also named after the famous Brazilian musician Antônio Carlos Jobim, and on the other side there is the aeroporto Santos Dumont for national flights. The Aeroporto Galeão is located around 15 kilometers from the center on the Ilha do Governador (Av. Vinte de Janeiro, s/nº – Ilha do Governador, Rio de Janeiro – RJ, 21941-900). The Aeroporto Santos Dumont can be found the center in the quarter Centro (Praça Sen. Salgado Filho, s/n – Centro, Rio de Janeiro – RJ, 20021-340). There are several taxis leaving from the Aeroporto Galeão. However, I recommend to clarifying the price of the ride before entering a taxi as there are several taxi drivers without a taximeter. We decided to use the bus Premium Auto Ônibus after our arrival to get almost to the Copacabana. The bus also stops at the bus terminal Novo Rio (siehe unten). One ticket costs 15 R$ (March 2018). The journey from the airport close to the Copacabana takes about one hour. If you do not like to use locals busses or taxis, it is also possible to use Uber. The Aeroport Santos Dumont is located in the quarter Centro, and thus, close to the metro station Cinelândia. You can find more information about the metro network in Rio de Janeiro on their website. The network of buses in Brazil is very good. Thus, Rio de Janeiro can be easily reached by bus. There are several bus companies located at the central bus terminal Rodoviária Novo Rio in the quarter Santo Cristo (Av. Francisco Bicalho, 1 – Santo Cristo, Rio de Janeiro – RJ, 20220-310) with connections to several regions in Brazil. You can buy tickets either at the bus terminal or online via websites like Clickbus or Brasil by Bus. If you have booked a ticket online, you still have to pick up your ticket at one of the bus company’s terminals or at the ticket desk. I experienced the bus terminal Novo Rio as a very lively place. Although we had to stay at the bus terminal even at night, I felt safe within the building of the bus terminal. When we arrived in Rio de Janeiro by plane we stayed at the hotel Linux as it was already night and we wanted to relax after our long flight, because on the next day we planned to travel to Ouro Preto in the evening. The hotel Linux is located at the Avenida Vinte de Janeiro, S/N – Galeão, Rio de Janeiro – RJ, 21941-900. We stayed at the hotel Linux as it was close to the airport and because there are shuttle busses from the airport to the hotel. The hotel was a perfect stay after our late arrival at the airport. If we would have arrived during the day, we would have looked for an accommodation more in the center of the city. But due to our late arrival, the location of the hotel Linux was perfect. If you wish to see Rio de Janeiro, I definitely recommend an accommodation closer to the center. We stayed at the hotel Linux only for one night but felt safe and comfortable there after our arrival. 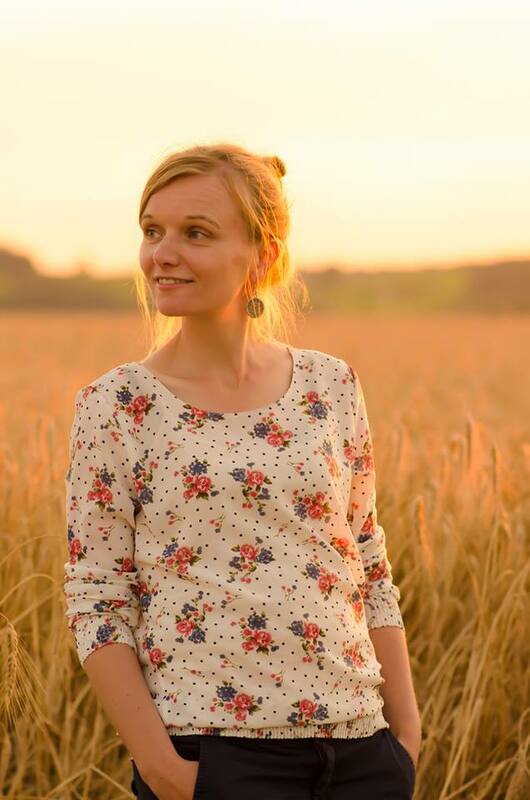 I booked the hotel at home in Germany and paid for two persons and one night 56 Euros. As mentioned, after our arrival in Brazil we stayed only for one night in Rio de Janeiro and moved on to Ouro Preto. But when we came back to Rio de Janeiro after visiting Minas Gerais and Espírito Santo, we stayed at accommodations booked via Airbnb. One of our accommodations was located in the quarter Leme, that means, in the street Rua General Ribeiro da Costa. At the entrance area was a security. From Leme it is not far away to Copacabana and Ipanema. Even the Sugarloaf Mountain can be reached by foot. Before our departure we stayed few more days in Rio de Janeiro. We booked again via Airbnb but in a different quarter. We booked a place close to the bus termina, Novo Rio in the quarter Santo Cristo in the street Rua da Gamboa. Our host was very friendly and did everything to let us feel comfortably in our accommodation. The surroundings of Santo Cristo and Leme were quite different, but for me it was enriching to get different views of Rio de Janeiro. We took several times local buses in Rio de Janeiro. If you enter a bus, you do not have to pay at the driver but at the second employee who sits in the front of the bus. One trip costs about 3.50 R$ (March 2018). It is a big advantage to speak some Portuguese in the bus especially if you have to ask which bus line you have to take to get to your destination. There is also a metro in Rio de Janeiro. As I did not use the metro I cannot share personal experiences here. If you take a taxi make sure to clarify the price of a ride as some taxi drivers use taximeters and some do not. In one situation a taxi driver offered us a ride from the bus terminal Novo Rio to our accommodation in Santo Cristo (less than 2 kilometers) for a price that is similar to the price from the bus terminal to the international airport (about 14 kilometers). If you do not like to use busses or taxis, it is also possible to order Uber in Rio de Janeiro. How to get to the Sugarloaf Mountain? As we stayed in Leme when we visited the Sugarloaf Mountain we could walk to the peninsula Urca. The official website of the Sugarloaf Mountain can tell you more about the timetable of the cable railway and the prices. 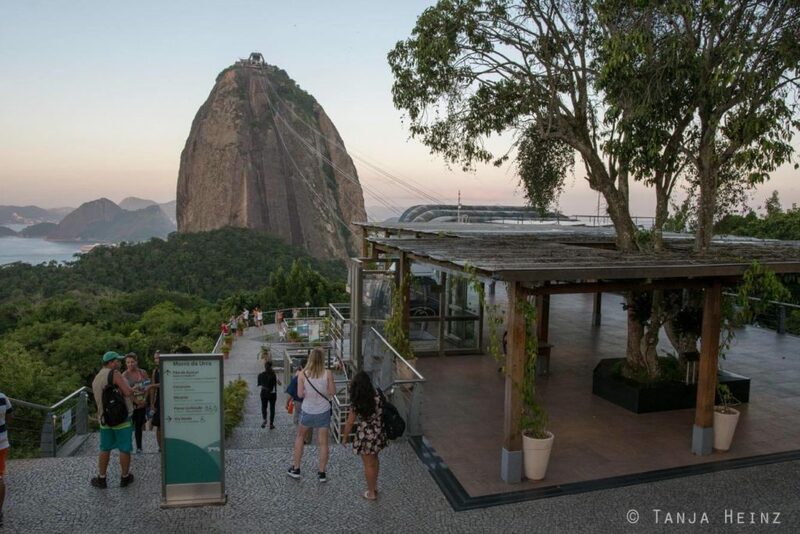 You can reach the Sugarloaf Mountain as well with public transport like with the metro line 1 or 2 which stop at the station Botafogo. 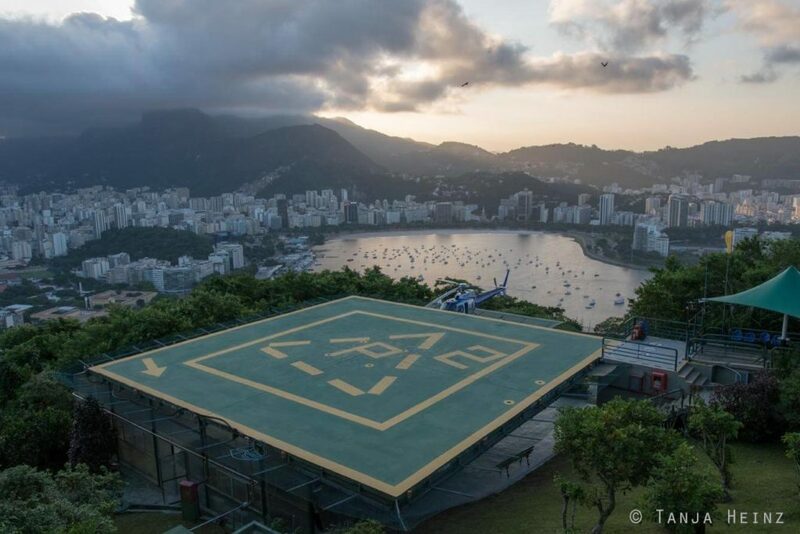 From there you can take the bus 513 – Botafogo Urca into the direction of Urca. You can’t miss the Sugarloaf Mountain.